After its campaign of Easter freerolls, Juicy Stakes Poker is at it again this weekend with a pair of zero-cost multi-table tournaments offering to hand out a total of $1,000 in cash. Players can visit the online poker site tomorrow from 7pm New York time to take part in a freeroll with over $500 in cash up for grabs while a companion game will kick off at 4pm on Saturday offering an identical prize pool. 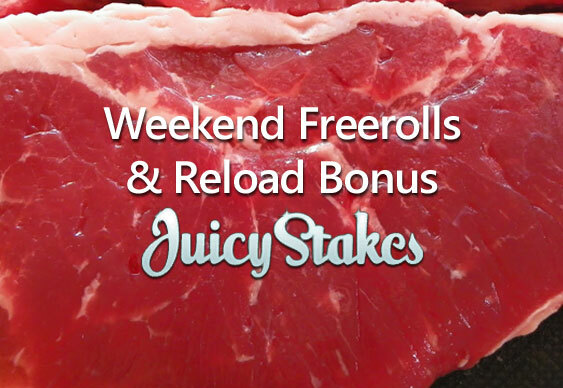 “It wouldn’t be a weekend without a couple of extra freeroll poker tournaments and a nice reload bonus and Juicy Stakes Poker comes through once again,” read a statement from Juicy Stakes Poker. On top of the freerolls, Juicy Stakes Poker is also offering to double any deposits made this Friday, Saturday and Sunday up to a maximum of $100. Finally, Juicy Stakes Poker awarded tournament player ‘nooly77’ with a prize package worth $2,000 into the Madrid Live Deep Stack Poker Festival last month and revealed that the winner had been eliminated from the $1,063 buy-in event late in level 7. The Spanish tournament took place at the Casino Gran Madrid from April 24 to 27 with ‘nooly77’ stating that he had enjoyed the live experience despite not emerging as the overall champion. “I picked up KJ suited diamonds...raised and was called by only one player,” said ‘nooly77’.